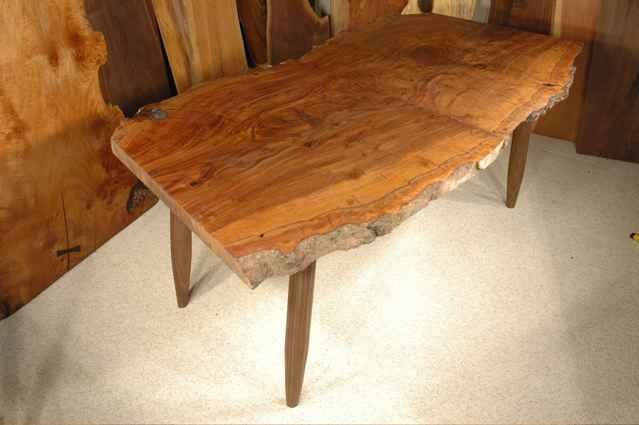 Handmade Custom Walnut Dining Tables WITH NATURAL EDGES AND ORGANIC SHAPES. Rustic Walnut dining tables made from eco-friendly reclaimed wood. Unique, Unusual, Artistic, One of a kind, Custom, Rustic Walnut Wood Tables made to order!!! 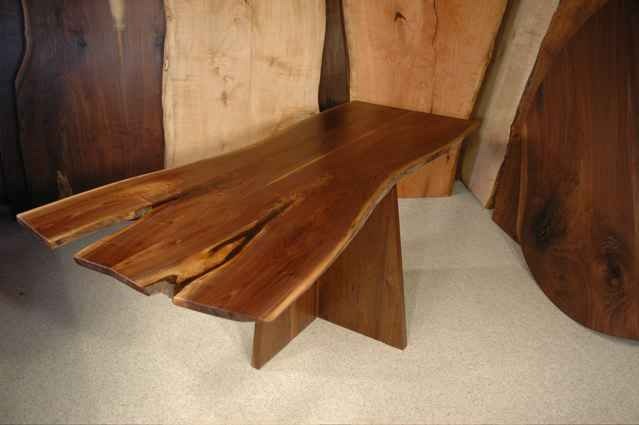 EXTRA LARGE -The “Welch” Custom Walnut Slab Crotch Custom Dining Table with natural edges and organic shape. Approximately 9′ long x 46″/65″ wide. The “Binder” walnut slab custom dining table with burled maple base. Approximately 6′ x 36″ custom walnut slab dining table. Approximately 7′ x 36″ wide- Walnut Slab Custom Dining Table. 1″ Table A. Approximately 7′ x 40″ wide- Walnut Slab Custom Dining Table. 1″ Table B. 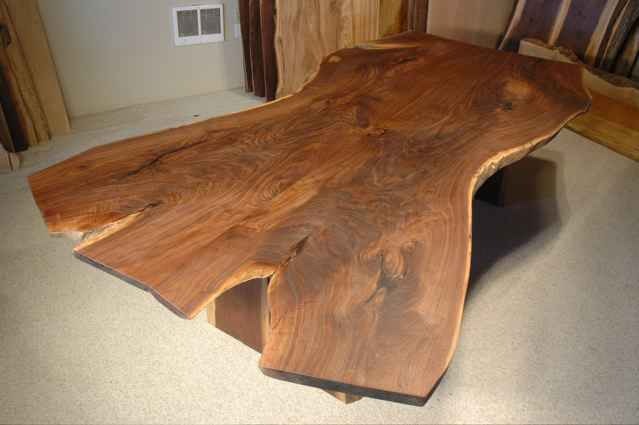 Approximately 7.5′ x 32″ wide- Walnut Crotch Slab Custom Dining Table. 1″ Table C.
79″ x 43″ Book matched Figured Claro Walnut Slab Custom Dining Table with Walnut Slab Base. 79″ x 43″ Book matched Figured Claro Walnut Slab Custom Dining Table with Hand Turned Walnut Spindle Legs. Organic 7′ x 29/39″ x 1 5/8″ Thick Walnut Crotch Slab Custom Dining Table with spindle legs. Nakashima style walnut custom dining table with 2 “live” or natural outer edges exhibiting beautiful sapwood cream color. 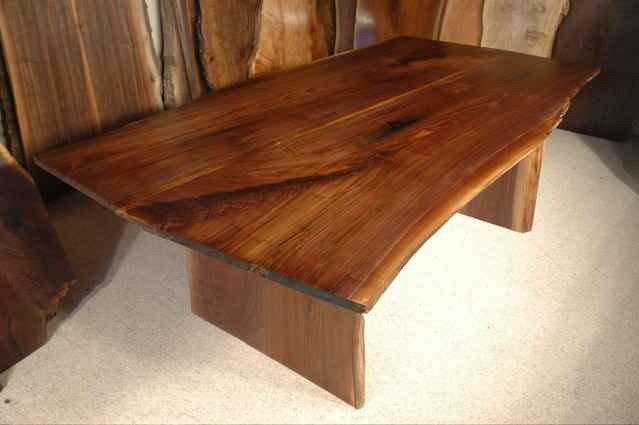 Rustic Furniture – Walnut levitating custom slab dining table with natural edges and trestle base.